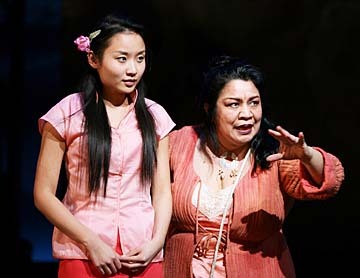 Li Jun Li, left, and Loretta Ables Sayre perform at Lincoln Center. Loretta Ables Sayre has been singing professionally since 1979, when she joined Keola and Kapono Beamer's act at the Reef Hotel in Waikiki. She's opened for such stars as the Four Tops, James Brown, the Beach Boys and Kenny Loggins. She's done a lot of community theater, commercials and television -- her biggest recurring role was probably that of Aunty Jackson in "Baywatch Hawaii." Or Loretta the waitress in Bank of Hawaii's old "Harry and Myra" commercials. But Ables Sayre has grabbed the brass ring: She opens Thursday in "South Pacific" at Lincoln Center in New York -- her Broadway debut. She plays the part of the flamboyant Bloody Mary and gets to sing one of the show's signature songs, "Bali Hai." "It's always been a dream of mine to perform in a Broadway show, but something that seems unattainable living in Hawaii," Ables Sayre says. 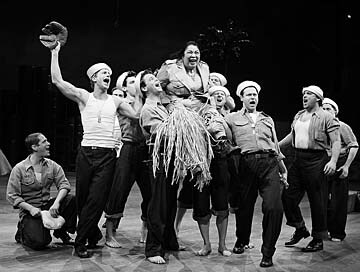 Loretta Ables Sayre (center) and company in a scene from the Lincoln Center Theater production of "South Pacific." It's been 96 years since performers from Hawaii first appeared in a Broadway show, and although many island residents have performed there over the years, none come to mind who have debuted bigger than Loretta Ables Sayre, who opens Thursday as Bloody Mary in Lincoln Center Theater's production of "South Pacific." Bloody Mary, a tough and wily Tonkinese "operator," is the major supporting role in Rodgers & Hammerstein's classic musical about cross-cultural romances during World War II. She has two memorable songs: "Bali Hai" and "Happy Talk." Ables Sayre has been doing public "preview performances" of the show for a month but made time to answer a few questions by e-mail about her Broadway debut. Question: How did you find out that the producers were auditioning? Answer: My friend Randl Ask told Ted Sperling, the musical director, about me when he heard that they were still in search of someone to play Bloody Mary. He then put Ted in touch with John Rampage at Diamond Head Theatre, who was then put in touch with Telsey + Co. casting agency. Their casting agent, Joe Langworth, came to town the following week and held auditions at Diamond Head Theatre. Q: Had you been thinking about performing in a Broadway show for a while? A: It's always been a dream of mine to perform in a Broadway show, but something that seems unattainable living in Hawaii. Q: What are the biggest differences between doing community theater in Hawaii and being Bloody Mary in "South Pacific" on Broadway? A: While doing community theater in Hawaii, you work at your day job during the day and rehearse at the theater at night. In New York they pay you a full-time wage to rehearse all day and do shows at night so all of your energy can be focused on the show and not how you are going to make money to pay your rent. Q: What are some of the challenges in playing Bloody Mary? A: It's a very vocally demanding role. Both of my songs are difficult enough to sing, but this role requires that I yell a lot, and it's just very taxing on the vocal cords. I worked with vocal coach Alethea Train in Hawaii to prepare me for the demands, and it really helped. Q: How do you see Bloody Mary as a character and as a person? A: You have to see her as a whole person and not just a character. She's a mother and a survivor who will work around the clock and do anything to ensure that her daughter has a better life than what she has experienced. Q: I'm guessing that like almost all of us you've seen the movie version of "South Pacific" at least once. Have you also read the book? A: Yes. Reading James Michener's "Tales of the South Pacific" was mandatory for all of us since the production of the show is heavily based on Michener's character development. Q: Did anyone involved in casting tell you why you were selected? A: Yes. Bart Sher, our director, who had spent some time in Hawaii, said that I brought personality traits of Hawaii's local women that he was looking for -- women who could be tough and loving at the same time. Q: What's been the most memorable thing that's happened in rehearsals? A: Singing with our 30-piece orchestra for the first time. It's an amazing experience to sing these beautiful songs with this magnificent orchestra. Oh, and getting stopped on the street by actor/singer Mandy Patinkin after he had seen the show with his wife was pretty amazing, too. "South Pacific" plays at the Vivian Beaumont Theater, Lincoln Center, New York, Thursday through June 15. Visit www.lincolncenter.org.